Ever wonder what happens to retired airliners once their flying days are over? Most of them are parted out with the remaining fuselage chopped up and sold as scrap aluminum. A few escape the scrapper’s blade to be displayed in museums. Still fewer are given a reprieve by members of an exclusive club of individuals who have turned their aeronautical flights of fancy into reality, without ever leaving the ground, by transforming salvaged airplanes into personal residences. As airlines continue to downsize their fleets, the number of airframes available for such projects has significantly increased. With a growing number of aircraft going into storage, market factors should translate into lower acquisition costs and greater opportunity to acquire a more complete airliner as the demand for parts is diminished. This is particularly true for the Boeing 727, an aircraft type being purged from airliner fleets to make way for more modern aircraft. Olympic Airways Boeing 727-284, serial number 20005, made its first flight on Jan. 29, 1967. Christened “Mount Parnassus,” it was registered SX-CBC and delivered on Feb. 7, 1969. It spent its entire flying career with Olympic. Subsequent to its withdrawal from service, on Halloween evening 1999, it touched down at Hillsboro Airport in Oregon, where its new owner, Bruce Campbell, an electrical engineer, greeted it. Campbell, a self-professed techno-nerd, is the sole employee of Hypatia, a company that manufactures high performance and precision high current sourcing milliohm meters and support software used primarily in the medical and telecom industries. Above: In December 1988, this 727 (N88701) was transporting passengers for Continental Airlines. A home is the biggest investment of your life and you don’t want to invest in something that will only last one generation. An airliner, unlike contemporary structures, is a sealed, pressurized canister that will last a long time with a minimum of maintenance. The solidness and integrity of the protective enclosure provides strength and safety. “Effectively beat off the corrosion, and you’ve got it,” Campbell said. 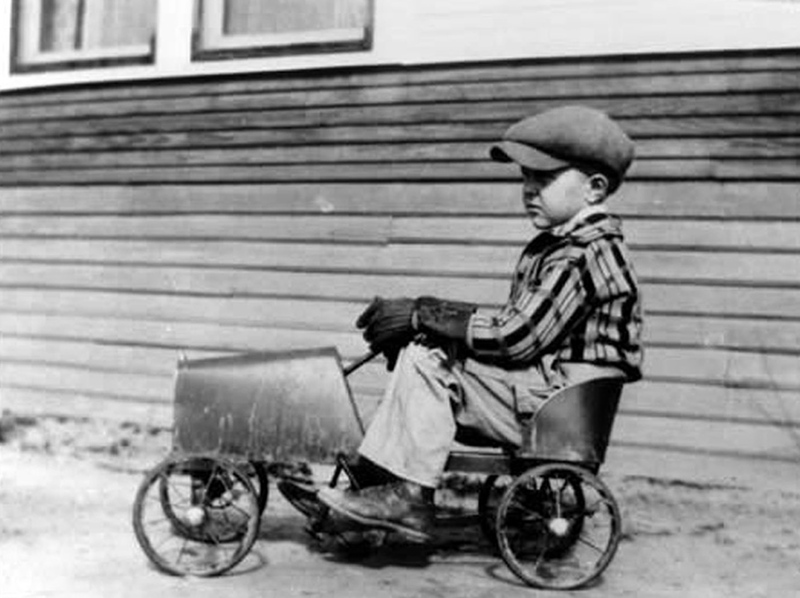 Growing up, Campbell was a typical kid who thought jets were cool. 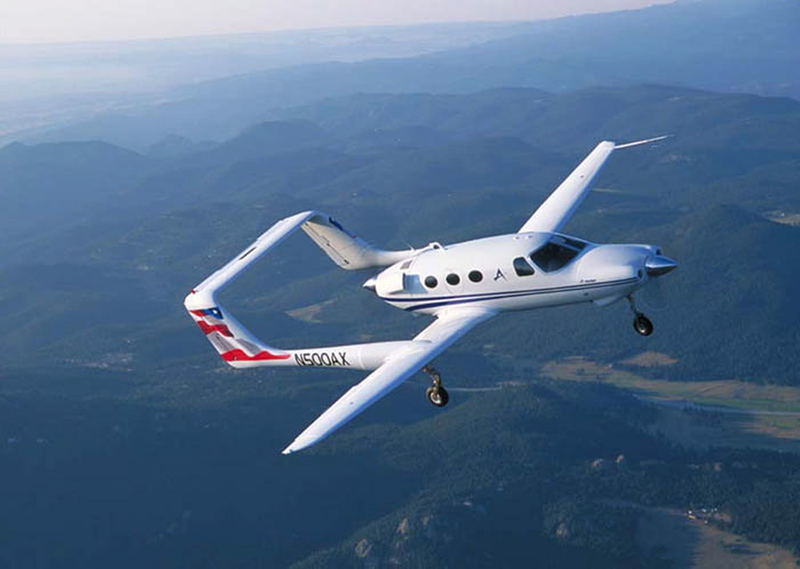 He acquired his private pilots license and once owned a Beech Sierra. In 1998, he was living in a mobile home acquired in 1977, which was showing signs of deterioration. Feeling it was time to move into something more substantial, he first considered a habitat made from freight vans or possibly a geodesic dome. JoAnn Ussery and her airliner home, on the shores of Lake Whittington in Mississippi. Then, one afternoon, he listened to a radio program featuring the Continental Airlines 727 JoAnn Ussery lived in. 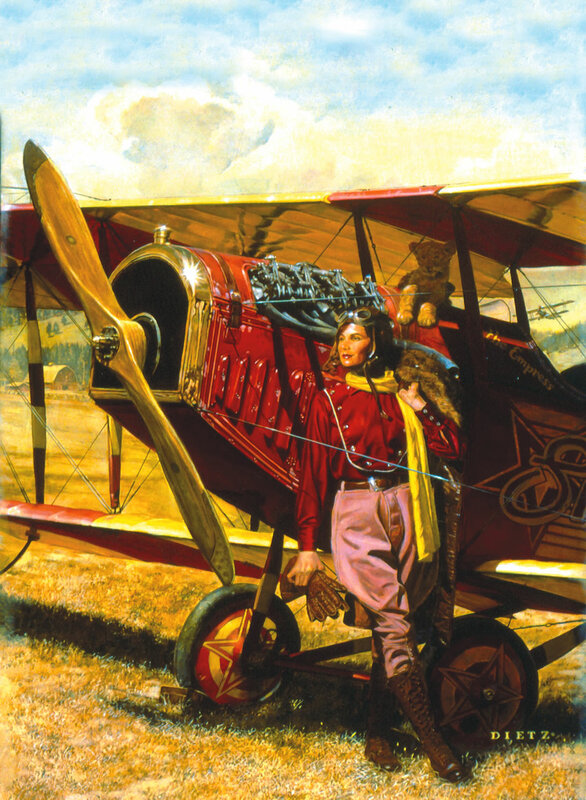 Campbell was on the phone the next day contacting aircraft salvage companies, checking on the possibility of acquiring a suitable aircraft. He entered into a contract with Aero Controls, based in Shelton, Wash., obtaining the retired Olympic Airways 727. Once it was flown into Hillsboro, an offsite salvage operation was performed. On that Halloween evening, it was immediately towed off airport property across the street to the Hillsboro Fair complex, which was necessary because of contract limitations with the local fixed base operations at Hillsboro Airport, which stated that no heavy maintenance could be performed outside of a hangar. It took three and a half months to part the plane out and start the 12-mile move to Campbell’s 10 acres of land situated in the rolling countryside near Laurel, Ore. Campbell paid $250 a day for the use of the fairgrounds for the first month and $150 a day after that until the aircraft was moved. The Boeing 727 itself cost him $100,000. For his money, he got the fuselage and a number of parts that typically would be salvaged, such as the landing gear and flight control surfaces. Wayne Grippin Construction and House Moving transported the 727 from the airport to Campbell’s property—no easy task since they had to go right through downtown Hillsboro. That move cost Campbell another $12,500. 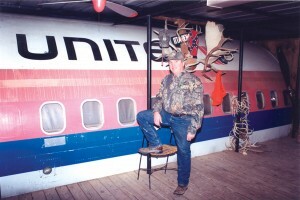 Gary Bright, co-owner of the Boeing 727 Hunting Lodge, on the enclosed wooden porch constructed on the forward starboard side of the fuselage. Today, Campbell’s aircraft sits on a plot of land surrounded by 3,500 Douglas Firs, which he planted over a seven-year period. A lover of both nature and technology, he views the situation as a wonderful marriage between the environment and high technology. 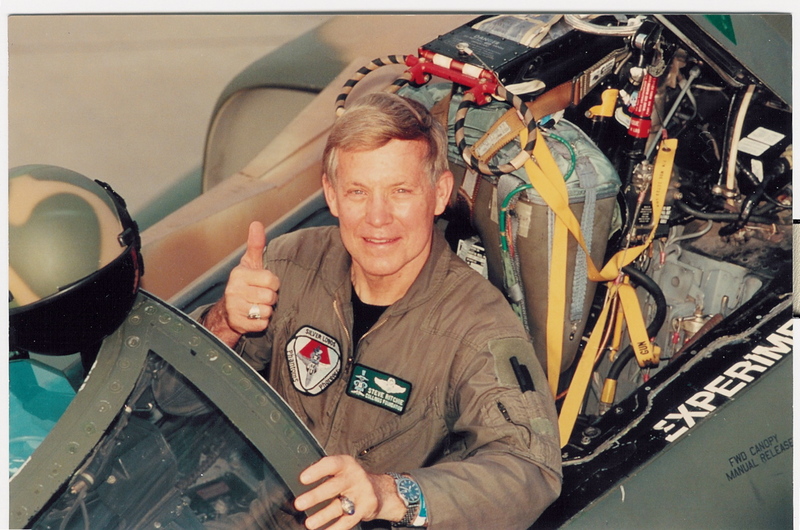 He plans to restore the aircraft to at least 85 percent of its original configuration. In the meantime, he still lives in a mobile home while work goes on to complete his 727 dream house. As airplane homes go, his is already the most complete and esthetically the best looking from the outside. The tail and right wing have been attached. His objective is to turn the retired airliner into a comfortable home, while preserving the feel of an aircraft. A function of time and money, he has no idea when he will get to the level of completion required to actually move in. His current list of priorities includes securing and putting in place concrete pillars under each landing gear; currently, the gear is resting on wooden railroad ties. He also plans to reattach the left wing and weld the wings and tail to the fuselage; they are temporarily bolted together. He will also fully resurrect the aircraft’s electrical system and complete the restoration of running water in the lavatories. Campbell has no current plans to install any walls, subdividing the aircraft into rooms. The open tube look will be maintained. There will be no lamps, with all of the illumination coming from the aircraft’s original lighting system. For the appliances such as those found in a standard kitchen, a separate electrical system will be installed. One unique feature of the Boeing 727 he can avail himself of is to climb up into the number two engine nacelle on top of the fuselage, where one can go to get away from it all and simply contemplate the universe. 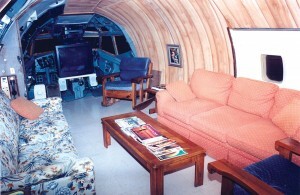 A living room occupies the forward section of the converted airliner. The TV and entertainment center is setup in the former cockpit. With respect to the future, Campbell envisions airplane home subdivisions with dozens of airplanes, all neatly aligned in rows. 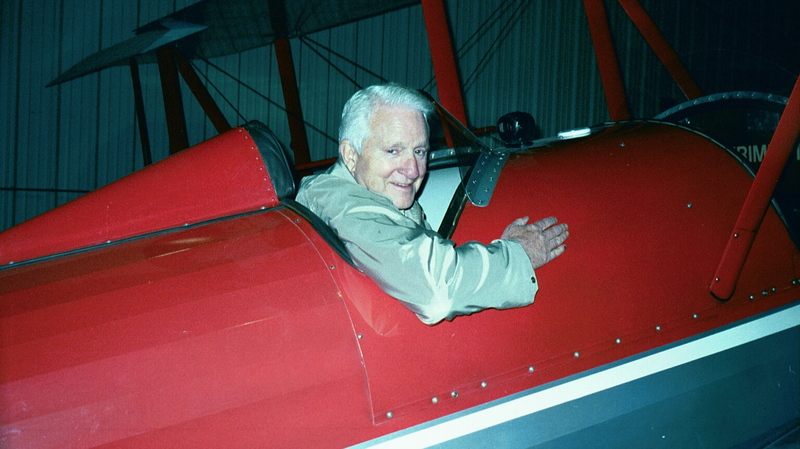 When asked what advice he would have for anyone contemplating an airplane home, he said to contact him after looking at his website www.airplanehome.com. 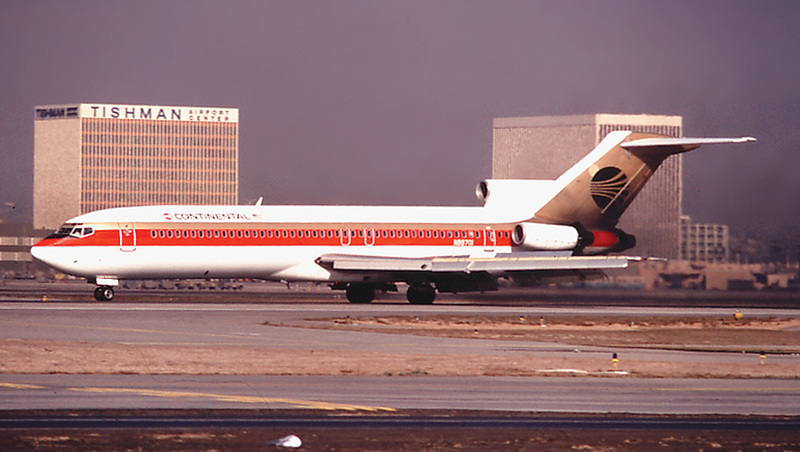 Continental Airlines’ first Boeing 727-224, serial number 19510, made its maiden flight on May 11, 1968. It was registered N88701 and delivered to the airline on May 21, 1968. 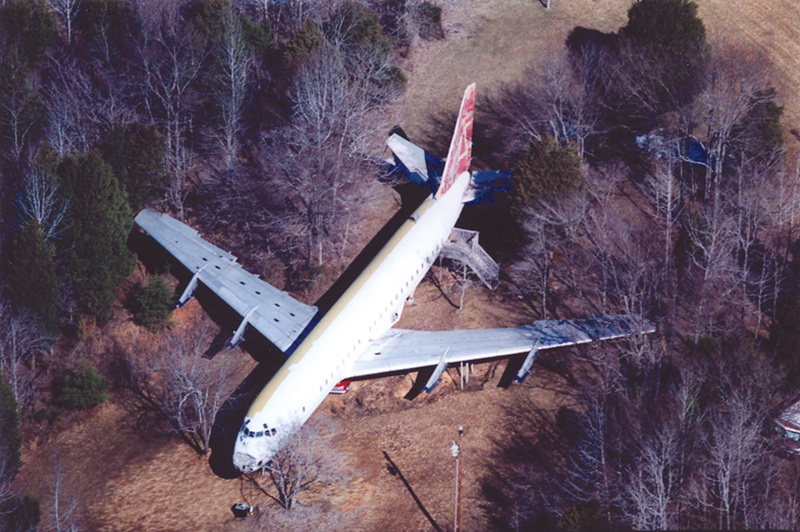 The airline operated it until Sept. 20, 1993, when it was stored briefly at Sherman, Texas, before being flown to the Memphis Group in Greenwood, Miss., to be parted out in May 1994. Later that year, JoAnn Ussery, a 52-year-old hair stylist living in Benoit, Miss., found herself in the market for a new home, after losing her 1,400-square-foot wood-frame house to an ice storm, when trees laden with ice fell on the house, flattening it. She looked for a new mobile home, until Bob Farrow, her brother-in-law, an air traffic controller at Greenwood Airport, suggested she look into getting a retired jetliner. 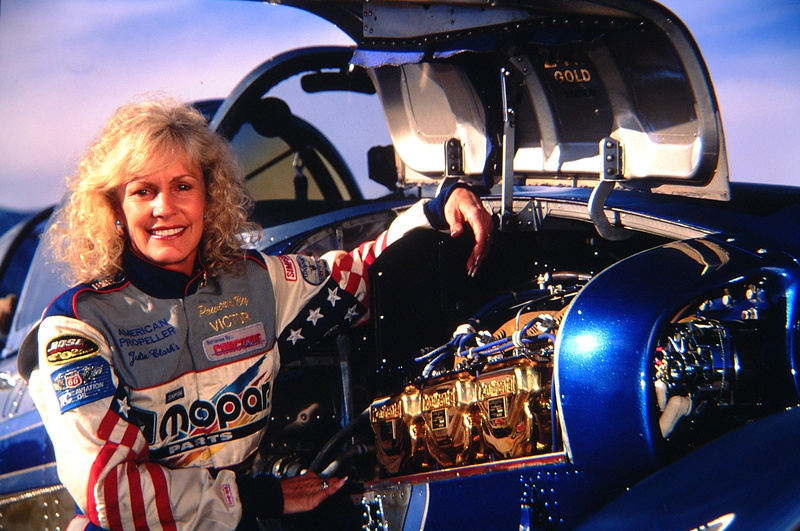 After all, she didn’t live very far from the airport in Greenwood, where one of the premier aircraft salvage companies in the business regularly parted out airliners, including a Northwest Airlines Boeing 727 hijacked by D.B. Cooper in 1971. The kitchen area has all of the standard appliances. It took several months to get the aircraft released. When it was available, she plunked down $2,000, and then hired the Bo Branch House Moving Company to transport her new 127-foot-long home the 69 miles to her lakeside plot in Benoit. Ussery did most of the remodeling herself. Lighting was converted to house current. Floors had to be built up in the bathroom and kitchen because they were uneven. 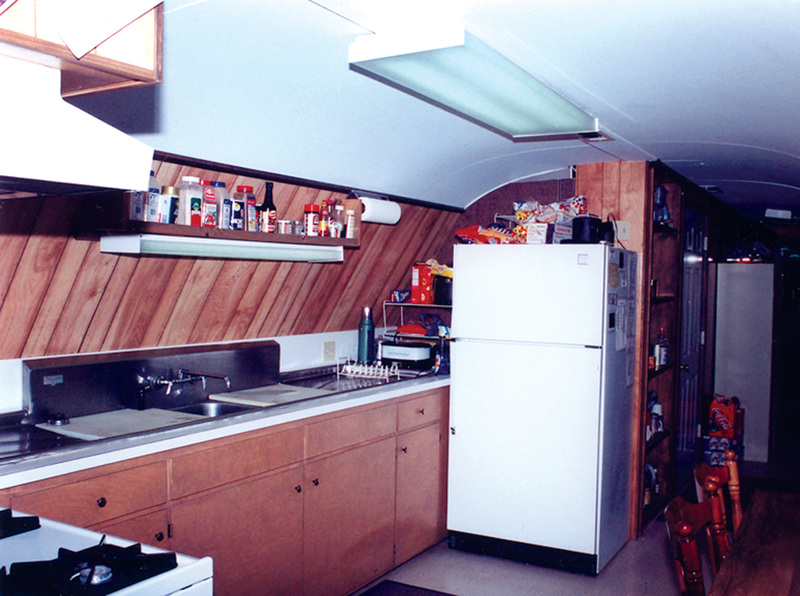 Conventional padding and carpeting were installed, and linoleum was laid down in the kitchen. One original lavatory was kept functional as an aircraft lavatory. Cockpit control wheels were retained to maintain an aircraft look. A garage door opener was used to open and close the rear air stairs. Overhead luggage compartments were retained, providing an abundance of storage space. 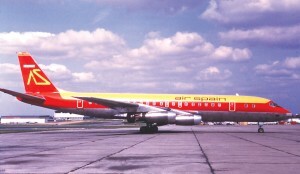 Red Lane’s DC-8 in airline service with Air Spain in 1973. 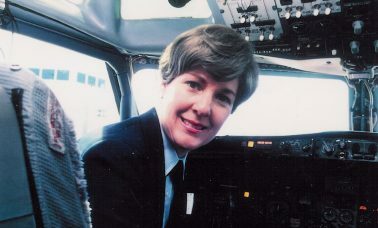 Ussery named her dream house “Little Trump,” a reference to Donald Trump’s $16-million corporate jet, also a Boeing 727. The floor plan consisted of three bedrooms, a living room/dining room, a fully equipped kitchen, a laundry area and her favorite room, the master bathroom with a Jacuzzi, in what was once the cockpit. The tail was anchored in 18 inches of concrete. 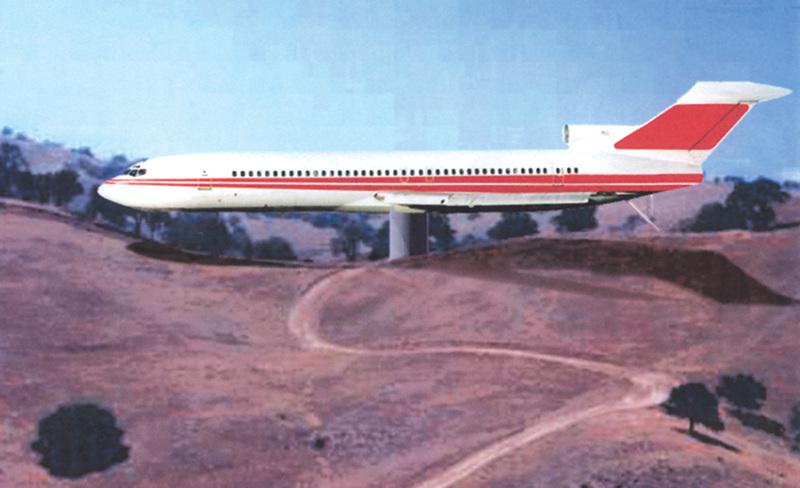 The nose extended out past the shoreline of the lake, giving the 727 home a dynamic look, as if it were flying. The 11-foot-wide cabin looks roomy with the high-density airline seats removed. The 76 side windows and 10 cockpit windows provide ample illumination. An aerial view of the DC-8 home. 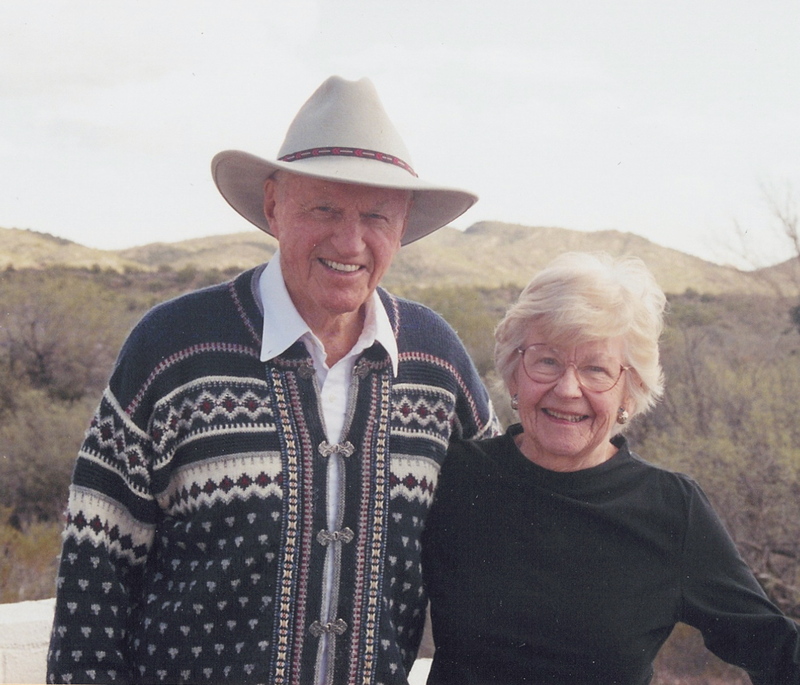 Ussery lived in her dream house from April 1995 to May 1999; on May 18, it was significantly damaged when it fell off a truck hired to move it one mile to a new location, where Ussery had planned to open it up for public viewing. It is not known when any repair work will be performed pending resolution of insurance issues. United Airlines’ Boeing 727-100, serial number 18319, made its first flight on Jan. 19, 1965. Registered N7027U, it was delivered on Jan. 27, 1965. After a brief lease to Alaska Airlines in 1980, it was returned to United, who operated it until 1990. The tri-jet was then sold to the Memphis Group, in August 1991, and parted out in Greenwood. Mac McNeer, Gary Bright and Doug Muse acquired the remaining fuselage, and moved it 27 miles to West Leflore County, five miles west of the town of Ittabena. The three men, members of a local hunt club, mostly a social club, which has about 50 members from Leflore County, acquired the 727 for $1,000. 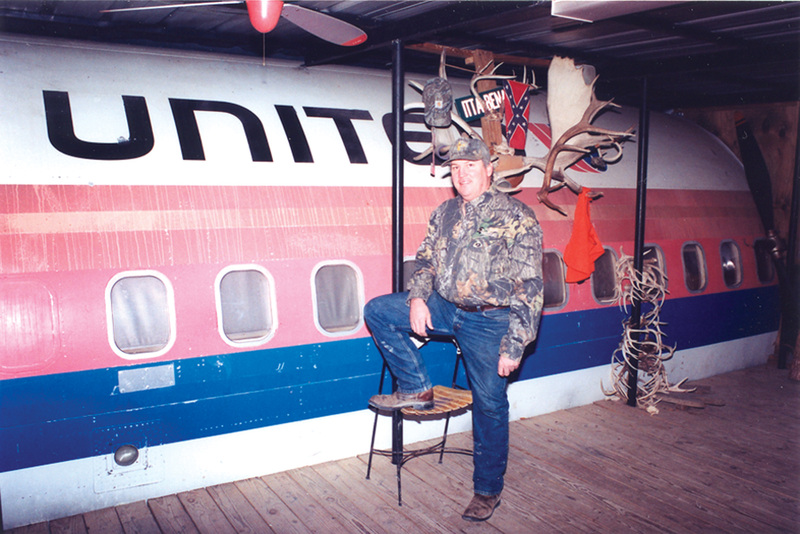 Today, N7027U is a fully functional airplane home sitting in a forested area on 4,000 acres of mostly timbered land of which the hunt club owns the hunting rights. The area is a sportsman’s paradise with an abundance of deer, dove and ducks. 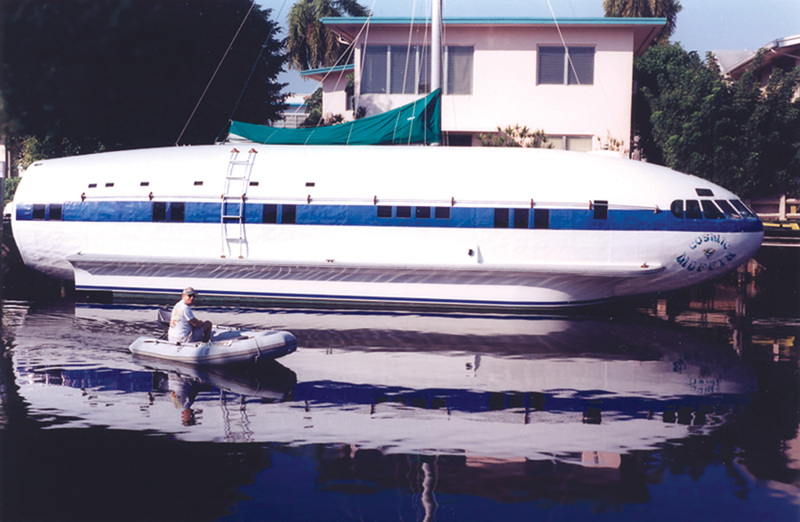 Dave Drimmer pilots a boat next to his Boeing 307 plane boat, at home at the Isle of Venice in Fort Lauderdale. It cost the men $1,800 to move the aircraft from the airport and set it up on concrete bridge pilings. The conversion work took an estimated six months and $20,000, and was supervised by Bright, who with McNeer, owns several businesses together (including Aviation Services, a crop dusting service in Sidon Schlater, Miss., a custom combine business where they harvest crops for other people, and a restaurant in Greenwood). The work performed on the inside of the former airliner to make it livable was substantial. 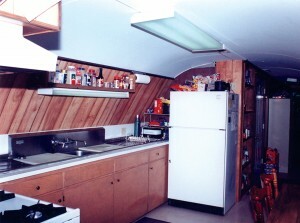 The original cabin liner had to be augmented with wood paneling to cover the area where overhead storage bins had been removed. Flight deck bulkheads were removed, opening up the cockpit to full view. The center console forms a platform for the TV and stereo system, in what is now the living room area. The kitchen includes a stove, refrigerator, microwave and sink. The aircraft was completely rewired at 220 volts and has central air conditioning and heat. Next is a large bathroom complete with shower. The last section, at the rear of the aircraft, is a spacious bedroom that is really a bunkroom outfitted with three double bunk beds. A rear aircraft lavatory has a standard toilet installed. The main entry door on the right side of the aircraft is sheltered by an enclosed sun deck, where there is a wood-burning furnace and gas barbecue. This is where the hunters gather in the evening to socialize, drink beer and snack on deer sausage. While Bright and McNeer may bring their families out to stay, you can’t help but feel that this modern day aeronautical hunting lodge was designed by men, for men. It has a comfortable but rugged feel about it. The plane boat’s famous bar where Hollywood stars like Rita Hayworth congregated during their flights with Howard Hughes at the controls. 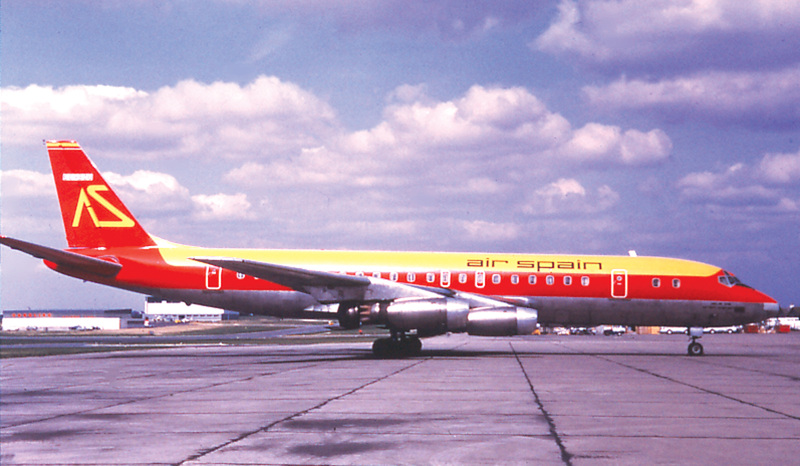 Air Spain’s DC-8-21, serial number 45426, was originally built for and delivered to Eastern Airlines as N8605 on April 9, 1960. In December 1971, it was sold to Air Spain, who registered it as EC-BZQ. Aerovias Quisqueyana purchased the aircraft three years later, and registered it as N8605. 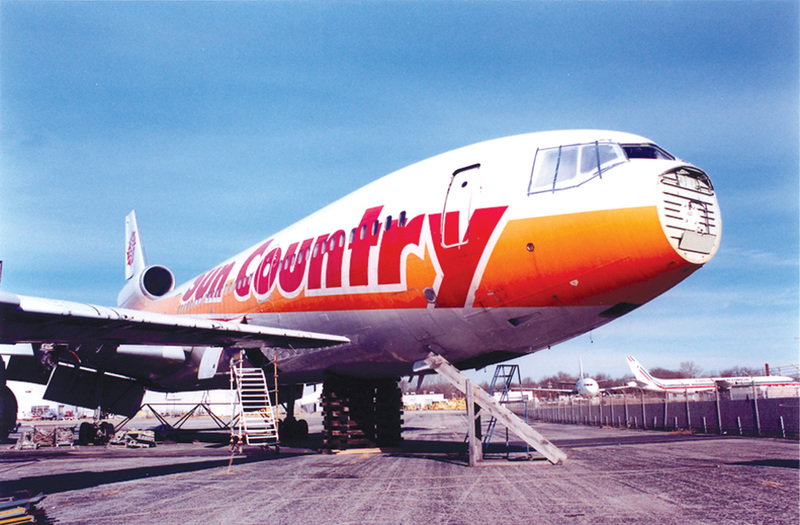 This Dominican Republic carrier owned it until July 1978, when it was sold to American Jet Industries, who parted it out in Smyrna, Tenn.
Red Lane acquired what remained of the airliner, and moved it to Ashland City, Tenn., where it was converted into a home. Reportedly, he has lived in it for over 20 years and still lives in it today. 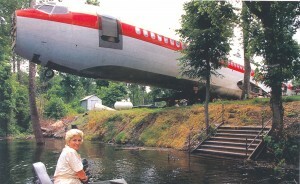 Undoubtedly, the most unique airliner home of them all is Dave Drimmer’s “plane boat.” Half airplane, half boat, the unconventional habitat started life as a Boeing 307 Stratoliner, model SA307-B (serial number 1997). It was one of 10 built in the 1930s as a 33-passenger airliner. Pan American and TWA operated the remaining nine aircraft. Manufactured in 1938, Drimmer’s airplane was purchased from Boeing by billionaire Howard Hughes, who hoped to set a new around-the-world speed record in it. Those plans were dashed with the outbreak of WWII. Hughes put the airplane in a hangar in Glendale, Calif., and didn’t fly it from September 1939 to May 1947. The government tried to draft it into military service during the war, but since Hughes wasn’t getting any military contracts, he made sure it was always in pieces when government inspectors showed up. Hughes invested a quarter of a million dollars changing the 307′s interior to one that included a master bedroom, two bathrooms, a galley, living room and stand-up bar. Actress Rita Hayworth helped in the design of the interior. 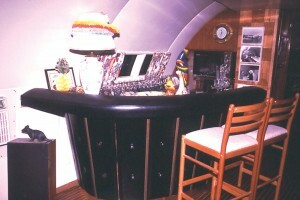 Hughes had three windows cut out behind the bar so that she could look out of the “Flying Penthouse” when they were flying. Max Power Aerospace offers Boeing 727 homes complete and ready to move in for $290,000. 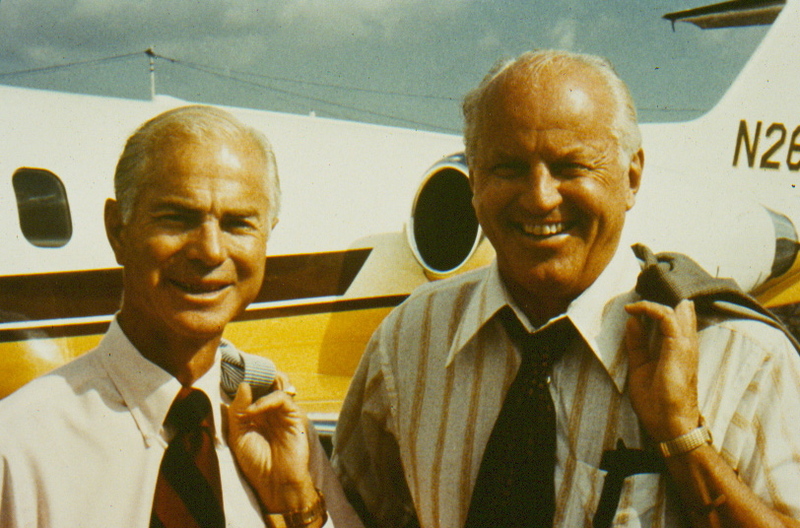 Howard sold the aircraft in 1948, to Texas oil millionaire Glenn McCarthy, who owned it for 14 years. After a number of different owners, it ended up in Fort Lauderdale, where it was eventually grounded because of damage sustained from Hurricane Cleo, in 1965. Four years later, it was sold at a public auction for $62 to a scrap dealer. Ken London, a real estate broker, bought it. With the wings and tail cut off, he mated the remaining fuselage to a fiberglass and wood boat hull. In 1981, Drimmer purchased it at a distress sale for under $10,000. In 1994, he invested over $150,000 rebuilding it into his “plane boat.” He installed a teakwood floor with sold teakwood inlay and teak plywood walls. The cockpit controls used to fly the airplane are used to drive the boat. The control wheels turn the motors on the boat and the throttles once linked to the aircraft’s four engines are now used to control the two boat motors. When singer Jimmy Buffett saw it, he included it in his book, “Where Is Joe Merchant?” He called it the “Cosmic Muffin,” a name that Drimmer adopted for his floating home of 20 years. They claim it’s “the fastest home in the housing industry.” Their ad can be found in such publications as the duPont Registry, A Buyer’s Gallery of Fine Homes. What they offer is a Boeing 727 retrofitted as a private residence. 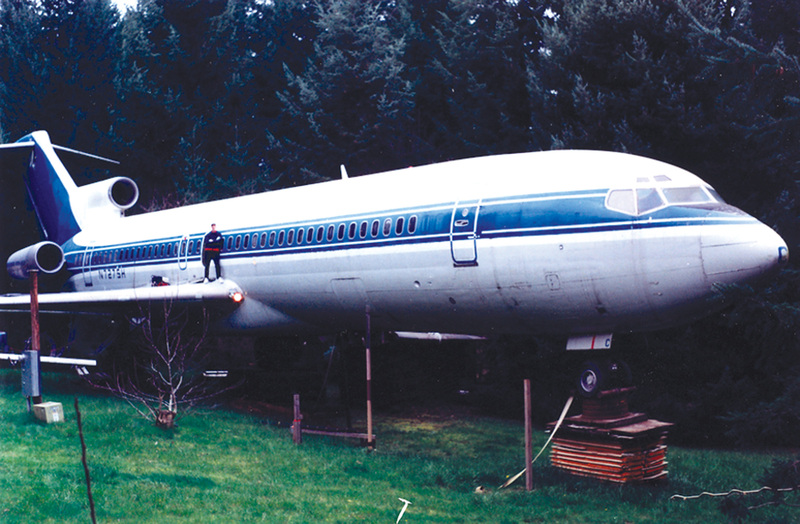 What is particularly unique about this airliner home, which could be a primary residence or a vacation home, is that it is mounted on a column, free to rotate in a perpetual holding pattern 25 feet above the ground. Tom Bennington, president of Max Power, in the cockpit of one of his 727s, displaying a model of a Boeing used as a billboard advertisement. The Smyrna, Tenn.-company that wants to populate the nation’s countryside and waterways with 727 airliner homes is Max Power Aerospace, Inc. Formed in 1998, the company’s primary business is salvaging retired airliners for their parts. 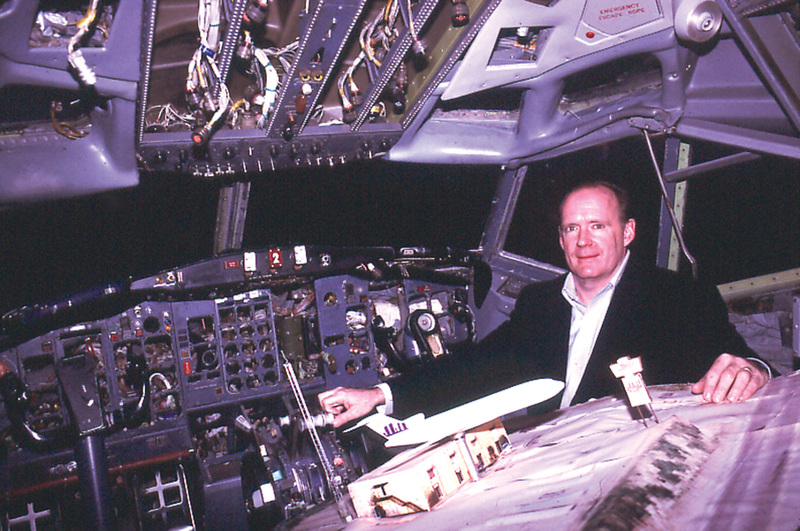 Tom Bennington, Max Power’s president and a former 727 captain, loves to talk about building houses out of Boeing airliners. The company now has a patent on its 727 house design, which can be set up on land, in a lake or even in the ocean. The patent is for a wind-resistant habitable dwelling, which includes the fuselage of an aircraft rotatably mounted on a support column. The vertical tail fin is retained to allow the dwelling to pivot about the support column and point in the direction of the prevailing wind. The fuselage of the aircraft has points along its undercarriage support framework for attachment of a rotatable support column, which is cylindrical in shape. For $290,000, you get the aircraft fuselage and both wings; the vertical stabilizer, including the #2 engine inlet; one Carbis staircase (main entry over the left wing); the finishing and sealing of unnecessary openings on the aircraft’s exterior skin, and an exterior paint job. You also get a finished interior package, including walls and lighting; the basic floor plan of kitchen, full bath, half bath, two bedrooms and public areas in the center of the aircraft, such as a living room; a connector, steel column and large bearing on which the aircraft smoothly rotates, and a steel and concrete footer that securely anchors the airliner home. 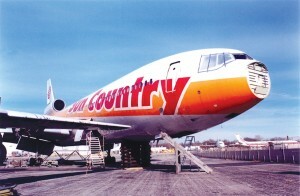 This former wide-body DC-10 airliner, once operated by Sun Country Airlines, has been parted out by Max Power. Converted into a habitat for humans, it could be the mansion of all airplane homes. 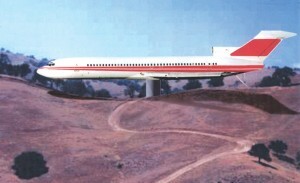 While a working example has yet to be constructed, there has been substantial interest in Max Power’s 727 home design. As this story goes to press, the company is working out the technical requirements for what could be their first sale. 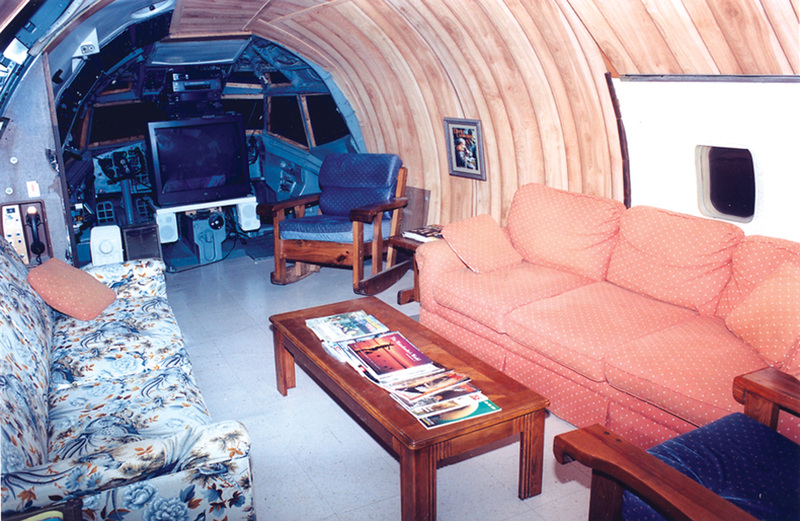 One thing is for sure; there is a certain romance associated with living in a converted airplane that is not experienced living in a conventional home. 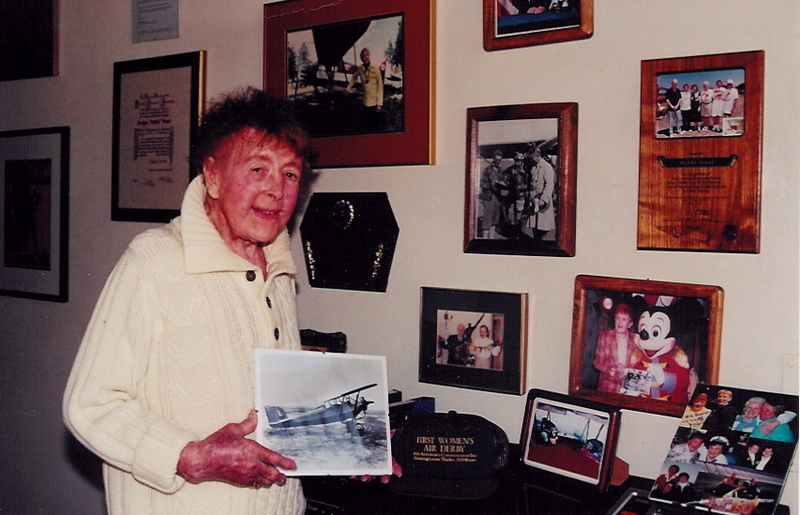 Dave Drimmer likes to think that the ghost and spirit of Howard Hughes are still present aboard his plane boat. He jokingly comments that when his time comes, he would like to go out in style with a Viking funeral at sea, complete with hay bales and flaming arrows. All kidding aside, the Boeing 727 has proven to be a practical habitat for humans, providing a good 1,200 square feet of living space within a structure that is both durable and relatively maintenance free.